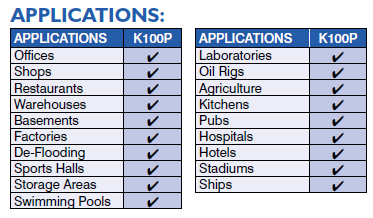 The K100P is the perfect solution to keep these costs and inconveniences at bay. This unit is the perfect choice to control humidity and maintain desired conditions in your premises with the capacity to extract up to 36 litres of moisture in a 24 hour period. Ebac Industrial Products K100P 30 litre per day commercial dehumidifier. Enormous costs are incurred every year through damage to inventory and through inflated building maintenance costs as a result of dampness. The K100P is the perfect solution to keep these costs and inconveniences at bay. This unit is the perfect choice to control humidity and maintain desired conditions in your premises with the capacity to extract up to 36 litres of moisture in a 24 hour period. Installation is quick and easy allowing for quick use after delivery. It also incorporated a high lift condensate pump allowing the moisture collected to be pumped away to heights in excess of 4m. By installing the K100P. Controlled humidity conditions can be maintained to give protection in larger commercial areas and buildings. Suitable For Large Storage Areas. Max Extraction 30 Lts Per Day.